You may have seen them in a health food store or a gourmet restaurant, looking like loose tangles of little pale threads with tiny unopened peas at the top. You may even have tasted them and decided “not bad”, because of their fresh, lively taste and texture. But have you ever tried making your very own sprouts? 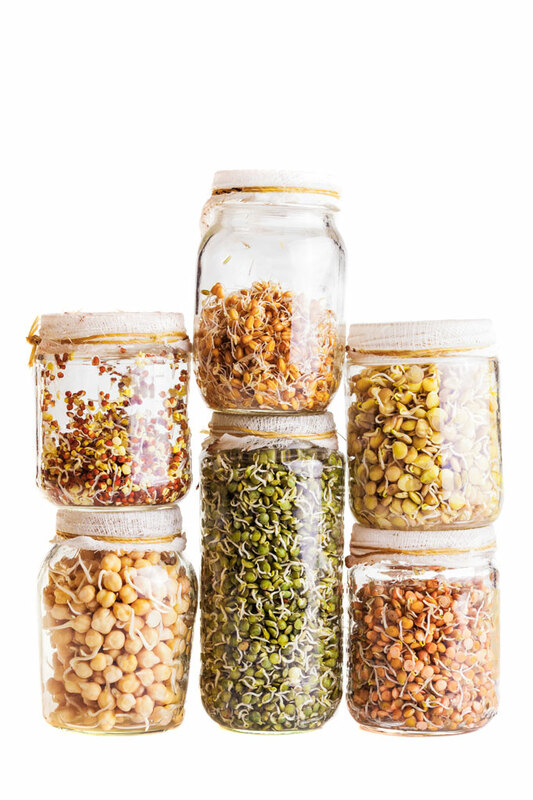 Here’s your easy, go-to guide to soaking and sprouting grains, legumes, nuts and seeds. I clearly remember the first time I decided to grow my own sprouts. I was at a college, transitioning to a plant-based diet, and on a tight budget. Sprouting seemed ideal because it provided a lot of nutrition for a low price. So I bought some alfalfa seeds (because they were the most readily available), a jar with a sprouting lid, and began to grow my own sprouts. I always remind my mom how she doubted me when she saw my sprouting jars on the kitchen counter. You see, before I found my passion for sprouting, I’d never been able to keep a plant alive for more than a few months. But sprouting was different. It was something so simple as seeing the little green leaf pop out of the seed that got me really excited. I’ve been sprouting for almost ten years now. I’m now branching out into sprouting a variety of beans, grains and seeds, and loving it. One of the main reasons for sprouting is nutrition. The simple process of sprouting brings out many enzymes, making the germinated seeds easier to digest. Sprouting also increases the amount and bio-availability of protein, vitamins, minerals, and antioxidants. Once sprouted, the protein content increases by as much as 20%, nucleic acids by 30% and many vitamins by as much as 500% …yes 500%. Pretty amazing! Sprouts can be eaten raw, cooked, or dehydrated. Sprouts that are eaten raw or cooked are referred to as “wet sprouts”; dehydrated sprouts are referred to as “dry sprouts”. Grains – I don’t normally eat (wet) sprouted grains in their raw state. My favorite way to prepare them is to either cook them into a porridge (buckwheat or oat groats make an incredible porridge) or serve them as a side dish (my go-to grains for a side dish are brown rice and quinoa). Legumes – I always cook sprouted legumes and use them the same as unsprouted legumes – sprouted hummus, sprouted dal, sprouted chili . . . you name it. Nuts and seeds – soaked nuts and seeds are my go-to snack. If I’m making a snack for my husband, I usually mix soaked nuts with some dried fruit and make a trail mix out of it. 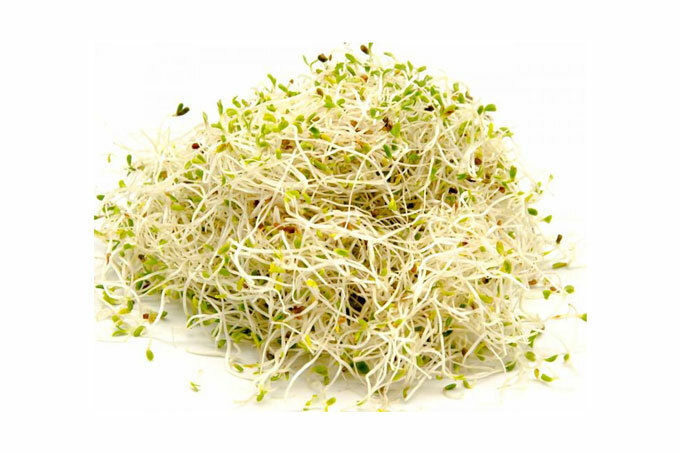 Vegetables – whenever possible, I top my salads and sandwiches with some alfalfa sprouts or mung bean sprouts. Compared to grains or legumes, vegetable sprouts are light in texture and very pleasant to eat even in their raw state. Grains – when I was in college, buckwheat groats and oat groats were my go-to cereal breakfast. Topped with some dried fruit and almond milk, I was always excited about my breakfast! Legumes – I’ve never used sprouted dehydrated legumes for anything but for grinding them into sprouted flour. Nuts and seeds – raw grain-free granola is another breakfast that makes me excited about my mornings. Now, raw foodists might disagree with me, but not all sprouts should be eaten raw. In fact, some sprouted legumes are toxic until cooked. Other legumes and some grains are still very hard to digest when raw. 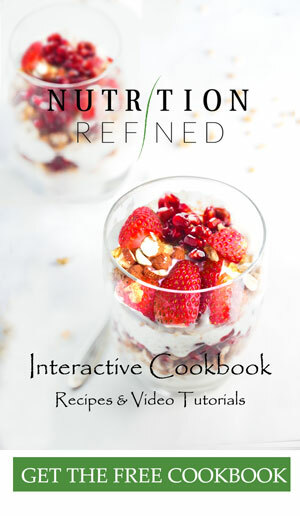 In her book Nourishing Traditions, Sally Fallon recommends not only cooking sprouted legumes, but also warns against eating high amounts of raw sprouted grains. Other sprouts including vegetables, nuts and seeds are fine to eat raw. I think the reason most people don’t sprout is because it sounds so intimidating. But let me tell you – it’s really not that hard at all. I know that we are all busy people, but sprouting will not take much time, and will give you much in return. Soak – in a large mason jar with a sprout lid, place your seeds and cover them with 2-3 times the amount of pure and filtered water (e.g. 1 cup seeds : 2-3 cups water). Skim off any seeds that are floating. Let the seeds sit for the given time. Soaking and sprouting times are different among each seed so refer to the chart below with the specific times. Drain and rinse – put a piece of cheesecloth over the mouth of the jar and secure it with a rubber band. Drain the seeds, letting all the water run out. Run cool water through the cheesecloth, swish the seeds around and drain. Repeat, then set the jar in a bowl or on your dish rack at a 45° angle so that any remaining water can drain out, but air can easily get in. Sprout – as with soaking, each seed takes different time to sprout. In this sprouting phase, keep rinsing the seeds with pure and filtered water several times a day. The goal is to rinse the seeds and drain the rest of the water off. Grow – when the seeds begin to sprout, you’ll notice a tiny “tail” coming out of the seed. The tail should be at least the length of the seed itself. If it’s not quite there yet, continue with the rinsing and draining process until it is. Some seeds take up to 5 days. Store – if you don’t eat all your sprouts right away, keep them in the fridge. Make sure you let the sprouts drain for at least 8 hours after their last rinse before you put them in the fridge because wet sprouts spoil quickly. The best way to store leftover sprouts is in a sprouting jar with an airtight lid. Tried green split peas – no sprouting. Are we talking about the whole peas. Gundry says sprouting doesn’t lower lectins level. Thank you for reaching out! Yes, you can sprout green split peas – I have done it several times (both yellow and green split peas) and never had any problems. Can you tell me what exactly went wrong? How many days were you soaking/rinsing the split peas? Hmm, I have read an interview with Dr. Gundry (I am sure I can still find the link if you’re interested) in which he said that soaking and sprouting legumes does diminish their lectin content. However, he also said that sprouting increases the lectin content of grains. Is that what you meant? Hey just getting into sprouting thanks for the great article and responses. I was wondering if you need a sprouting lid for soaking or if it’s okay to use a normal lid, and if refrigeration is required during any stage of sprouting anything. I was also confused what legumes you can eat as a raw sprout and which are best cooked. I like the idea of raw because I am on the road and do not have a kitchen, and I like the idea of not cooking out enzymes and prebiotics. Right now I have some split peas, lentils, and mung beans. Sorry for so many questions and if I missed them in your article, but I am sharing this article all over 🙂 it’s really helpful! Hi Andrew – I am glad you enjoyed the article 🙂 1. You don’t necessarily need a sprouting lid for the soaking phase. A piece of cheesecloth with a rubber band will be just fine. The cheesecloth will allow the seeds to breathe while preventing any dust or debris getting into the jar. 2. 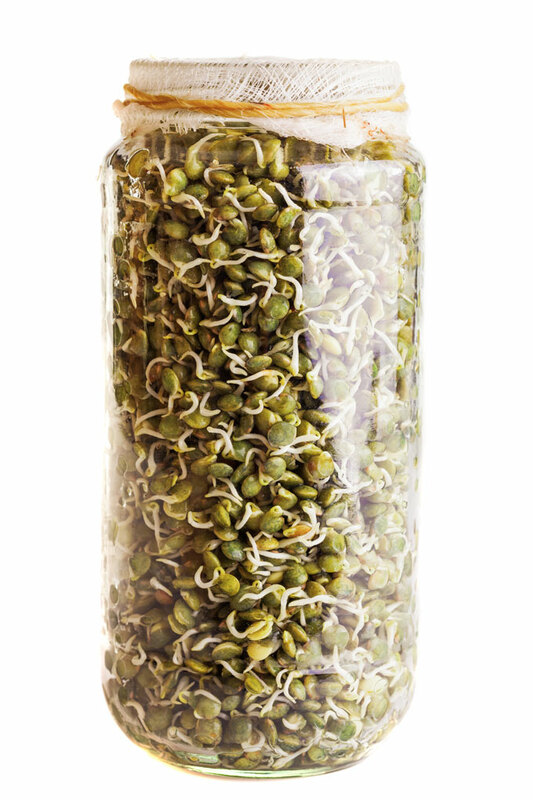 You only want to refrigerate sprouted seeds (no refrigeration required before your seeds are done sprouting and ready for consumption). 3. There are two reasons eating raw sprouts is risky. The first reason applies to all sprouts – they are grown in warm, humid conditions in which harmful bacteria such as E. coli and Salmonella also happen to thrive. The second reason only applies to grains and legumes – both grains and legumes contain toxins that are altered and deactivated by cooking. Eating a little is fine, but eating large portions or eating too frequently is likely to be problematic. Hope it helps. Feel free to reach out if you have any other questions, Andrew! 1. Would you recommend a pressure cooker? 2. Do all legumes, seeds, and beans, need to be soaked prior to cooking or eating? I’m particularly curious about lentils because I love them and want to get the most nutrition out of them as possible. I have issues digesting food and want to cook foods that will not only help me digest but also easily digest. My confusion is because many people online say do not soak lentils as it releases toxic chemicals? But cooking them should deactivate them right? I feel like they’re wrong but want to clear things up. 2. I also just bought a bunch of raw sprouted lentils, adzukis, and green peas from Whole foods that said they were tested for e-coli and salmonella. They seemed to digest well and were tasty but required a lot of chewing (energy). The only benefit of this seems to be getting extra enzymes and prebiotics/probiotics. I think the answer is that you’re right and that enzymes and probiotcs need to come from other sources such as fresh fruit and raw vegetables that are easily digested raw, and that beans and legumes are meant to be cooked for example like in Ayervedic cooking. 3. My confusion started when I saw a video of a raw vegan body builder who said he switched from eating cooked beans to sprouted beans and felt better. My intuition is that he was eating canned beans (which I’m assuming are not soaked first and thus the reason why they give people gas and indigestion). Hi Andrew, don’t ever hesitate to ask questions! 1. YES! (if you have the room for it, that is). If you’re into cooked legumes, a pressure cooker will save you so much time! My mom has one and I use it every time I am visiting her. The only reason I haven’t invested into one is that I have so many different kitchen appliances already that I really have to think before purchasing yet another one. Also, I am usually home with my children, so I don’t mind waiting for my legumes to be cooked (I imagine if would be different if I was working outside of home). 2. Lentils do not have to be soaked. However, soaking will reduce their cooking time and make them easier to digest and absorb their nutrients. Lentils, nuts and seeds have an outer layer that essentially protects them until they’re put in an environment where they’re ready to be sprouted. This environment is water. That’s why seeds are planted and watered, so that they can eventually sprout become plants. When you eat seeds, nuts and legumes without soaking them they haven’t yet had the chance to sprout and germinate. This makes them more difficult to digest, and makes their many nutrients and vitamins less available for absorption. Hey thanks again. I’ve got some Yellow peas, mung beans, and pumpkin seeds soaking right now for tomorrow to begin sprouting. A good resource I found for information and also buying quality seeds is The Sprout People. I actually bought some of their sprouts in a whole foods in south carolina and they were selling them uncooked but had been tested for contamination. They were excellent! They claim pumpkin seeds only need to be sprouted for an hour before beginning the sprouting process. Really looking forward to sprouting nuts and seeds because I have had a real special time digesting almonds and pumpkin seeds, and sunflower seeds, which I love but stopped eating! They also sell hemp sprouting bags which are naturally anti fungal and anti bacterial which means you can technically eat them raw (uncooked) and even sprout while camping or hiking worry-free. My question now is: doesn’t cooking sprouts destroy enzymes? I seem to be unable to digest lentils or beans regardless of whether they are soaked or not. Major issues…SO I’m kind of ruling out the pressure cooker for now. However, the sprouted, uncooked lentils felt great and I had no issues. This is because not only do they have undigestible enzymes which cooking removes, they have complex sugars which ferment and which SPROUTING removes. There are a lot of videos online of people sprouting chickpeas, lentils, quinoa, and then adding them to salads. This is also how my friend claims to eat them. I am looking forward to cooking with them but loved the raw sprouts I had from the sprout people in my salad and I think if you rinse properly and use COLD water then it is very rare that they would become unsafe. Just some food (haha) for thought! Thanks again! Just wanted to clarify that according to the sprout people the likelyhood of contamination goes down the bigger the seed/legume is. Hence the need to drain smaller seeds at a 45 degree angle as opposed to bigger legumes. As long as you thoroughly rinse and drain properly things like peas, lentils, and adzuki beans should be safe even if you just have them standing upright in a mason jar with airflow. I am new to sprouting. Bought a mason jar with mesh lid for sprouts. I cant get the really tiny seeds to drain, as they clog up the mesh lid before all the water can come out. What should I do? Hi Lin – a great question! To drain the seeds, you should place the jar upside down, BUT at an angle to allow drainage and air-circulation through the mesh. I can email you a photo of what it should look like if you’d like 🙂 Or you could also Google “sprouting rack” to see the angle. The water might not drain right away, but that’s ok. Just leave the jar at the angle and it should drain eventually. Let me know if this helped or if you need any more help. I have tried to sprout broccoli seeds but only about half of the seeds sprout. The others are just left in the bottom of the jar. I have tried this several times with variations — with less, rinsing and draining more, with a wet paper towel — and still no luck. Any suggestions? Thanks so much for your helpful clarifications. Thank you for taking the time to comment. I appreciate it! This is Lin, I do use a jar on an angle with a stand that was bought at Amazon for this purpose. I have just tried the small seeds again, and they do not drain fully. After 8 hours they are still in out 2 inches of water. Would using cheesecloth instead of a mesh screen help? This is pretty long after your question, but I simply buy large mouth mason jars and leave the lids off and follow these steps. – Spill out by holding my hand over the jar opening while shaking things like crazy. Jar opening is pointed down or at approximate 30 degrees. You will lose some produce. – Wash 2-3x times with tap water and then clean water. – Let sit on the counter and rinse 1x using the hand method 2-3 times a day. I never have problems with water on the bottom of the jar and any extra water tends to evaporate. Thank you for your article ! I’m a little confused on the difference between the soak and harvest times. So should I see sprouting after the soak times are complete? Should I drain and move the sprouts to the fridge after the soak time and then they sprout? Or should I see tails forming during the soak time? I tried several pulses and they all ended up getting smelly and not sprouting even after two days of rinsing a few times a day, maybe there wasn’t enough airflow? Thank you! HI Emily – great questions! Ok, so, the purpose of soaking (submerging the seeds in water) is to speed up the germination process. There are multiple reasons for that: 1. some type of seeds contain germination inhibitors that prevent a seed from germinating. These inhibitors much be leached away. In nature with natural rainfall, this process can take some time. But when you soak your seeds, this process is sped up. 2. For most seeds, moisture levels play a big role in alerting a seed to optimal grow times. By soaking the seeds, you can quickly boost the moisture content around the seeds, which signals to the seed that it is now safe to grow. After the soaking time, the seed will begin to germinate. The harvest time refers to the time it usually takes to see sprouts (little tails) coming from the seeds. You’ll not see any sprouts before the end of the harvest time. My sprouts have gotten smelly in the past too and it was always in the summer when the outside temperature was too hot. The ideal temperature for sprouting is 80 F. You don’t want to put your seeds in the fridge before the end of harvest time (during the sprouting process) because it halt the growing (sprouting) process. I hope I answered all your questions, but if not, please, don’t hesitate to reach out again! Thank you so much, that was SUPER helpful! I was leaving them fully submerged for too long, I think that was my error. Good to know about the temperature too! Hi Val – great questions! Yes, I do soak raw pumpkin seeds as well as raw sunflower seeds (I am yet to try sesame seeds). The amount of seeds you use depends on the seed, the size of your container, and how much sprouts you want in the end. I usually do about a cup of pumpkin/sunflower seeds, which yields about 2 cups sprouted seeds. There is no right or wrong amount. The sprouting process is the same for pumpkin seeds and sunflower seeds. I soak the seeds for about an hour, and then rinse and drain every 8 hours. They are usually ready within a day or two (depending on the ambient temperature of the house). If I want to keep my sprouts for a long time, I dehydrate them and store just like I would if the grains/legumes/nuts were not sprouted. You can totally freeze your sprouted grains/legumes/nuts/seeds … Ideally, you would dry the sprouted nuts/seeds before freezing. I use a dehydrator, but you could also just use an oven. (Spread sprouted nuts/seeds onto a regular sheet pan in a single layer. Place in the oven for 12-24 hours, stirring occasionally. Remove. Cool completely before storage. Store in an airtight container in the freezer). Some ovens also come with dehydrator settings. I have never tried freezing “wet” nuts/seeds. Thanks so much Petra. 12-24 hours in an oven seems like a lot of time and energy, which is why I’m a bit reluctant to dehydrate in an oven. After 7 or 8 hours of soaking, I see an end poking out of my almonds. Is that considered sprouted? Or will it grow a lot longer if you leave them a few more days? Hi Petra, thank you so much for providing us with your website. I recently found your YouTube channel and I love it! ! Your recipes look wonderful and nutritious and I can’t wait to try them starting with that hearty looking pumpkin seed bread. Anyway onto this subject of sprouting. I’ve sprouted many times before, and want to make it a regular feature, however something i’ve never been sure of and sadly you haven’t mentioned in this article is WHERE you leave the sprouts as they’re sprouting? Some say in a dark cupboard with a cloth over it, others on the kitchen countertop uncovered, some say you need to put it in the daylight towards the end of sprouting so that the sun helps them to grow green…. What do YOU do please? I’ve only sprouted fenugreek seeds, and mung beans, failing miserably with broccoli seeds, adzuki beans and everything else i’ve tried and i’m not sure if it’s because i’m leaving them in a dark cupboard (uncovered, but in a proper sprouting jar with holes and tilted at the right angle) throughout the whole sprouting process. Your advice would be MUCH appreciated please, because I would really like to branch out onto other things. And also before I forget have you ever sprouted flaxseeds? If so how long do they need to be soaked for etc? I look forward to hearing from you. Thank you and keep up the great work. Oh and just for information purposes i’m In the UK, and sadly the way my apartment has been built is that my kitchen is open plan with no windows at all so if natural light is needed then please let me know. Hi Gina – thank you for your lovely comment. This is why I love when people ask questions – I don’t always think of everything when I write a blog post. So, to answer your questions: the most important thing with sprouts is that they can breathe. Sprouts can grow just about anywhere – as long as they can breathe, but don’t have so much air movement that they dry out between rinses. I set my sprouts on the kitchen counter. I don’t mind the diffused sunlight or the 150 watts of incandescent light in my kitchen. Light just does not matter much in the initial stages of sprouting. A plant can only perform photosynthesis when it has leaves. Until then, light has little if any effect. Again – the most important thing is that your sprouts can breathe – so don’t hide your sprouts! I have tried sprouting flaxseeds once. They are tricky because they turn into a gel-like texture during sprouting. You will need a shallower dish – such as a terra cotta drainage dish if you have one — and less water. Here is what I do: soak about a teaspoon of the seeds for a few minutes and then drain them. Spread the seeds into a single (even) layer in the dish. Cover the bowl with a clear glass (again, I keep them on the counter top where I do get sunlight). Keep the surface of the dish wet at all times if possible (I like to spray the seeds with a little water twice a day). The last time I made flaxseed sprouts, it took 6 days (it was in the winter, so it might take less time in the summer). The sprouts will be about 1/2–3/4 inch high when they’re ready. Petra you answered my question perfectly. Thank you. It makes sense about light only being necessary when there are leaves. I can’t wait to get started now. And i’ve found a few videos already on YouTube that show how to sprout flaxseeds and also mentioned about the shallow terracotta dish. I’m sure like most things it will initially be a case of trial and error, but I’ll get there in the end. And any tips on sprouting sunflower seeds too will be much appreciated too as I couldn’t find any helpful videos on that one. Thanks in advance. Hi Petra. Many thanks for the very informative article. We have a biosnacky sprouted which we love, but are having problems with only getting short shoots. We only sprout in the winter and live in a cold house, so does the temperature make a difference? Hi David – thank you for reaching out! Before I answer your question, I would like to clarify – are you getting shoots or sprouts? We get very small shoots coming out of the seed (mung beans), but they go sort of mouldy before they get any longer. Last point, I was not able to view the sprouting chart. So, Petra if it pleases you, can you drop a copy in my “e-mail-box”! Much obliged and again thanks! Looking forward to another great video!!!! Hi Olive – thank you so much for the comment! I am happy my video helped 🙂 Sprouting really is easy. I feel like sprouting is like any other kitchen endeavor: it seems pretty daunting until you actually do it. As far as safety goes, cooked sprouts are not an issue at all since the heating process destroys bacteria. Raw sprouts are definitely susceptible to carrying bacteria. However, these cases have been reported from large sprouting operations in which the product changes hands many times. Home sprouting is a different entity all together. You have control over every aspect of the sprouting process, from ingredients to growth to storage. This basic principle is why home sprouting has not been considered dangerous. I will send a copy of the chart tonight 🙂 Please, don’t hesitate to reach out if you ever have any questions. I am here to help! You are a real inspiration to me because I am also a young mother of two sweet children and I try to cook us healthy food but I find it hard to stay very consistent. Part of my problem is that I am disorganized with my food planning and shopping. I was wondering what tips you have for planning and shopping as well as cooking healthy for children (thankfully my children are very good eaters and will eat pretty much everything I make so no problems with that).